You have learnt that each living organism has many organs. You have studied about the digestive organs which together constitute the digestive system. Each organ in the system performs different functions such as digestion, assimilation and absorption. Similarly, different organs of a plant perform specific/specialised functions. For example, roots help in the absorption of water and minerals. Leaves are responsible for synthesis of food. Each organ is further made up of smaller parts called tissues. A tissue is a group of similar cells performing a specific function. An organ is made up of tissues which in turn, are made up of cells. The cell in a living organism is the basic structural unit. 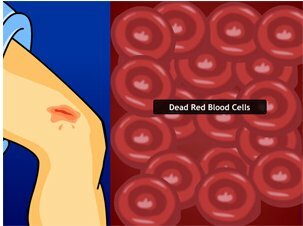 The black layer or scab (a hard coating on the skin formed during the wound healing reconstruction phase) that you see on a wound is a result of the aggregation of deadcover slip(RBC’s). The human respiratory system consists of the nostrils, nasal passage, internal nares, pharynx, larynx, trachea, bronchi, bronchioles and alveoli. Alveoli are the functional units of the lungs. All organ systems work together to form a complex organism. Organ systems include the digestive system, respiratory system, circulatory system, excretory system and nervous system. 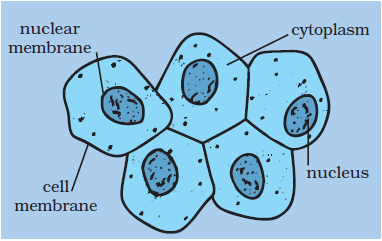 The basic components of a cell are cell membrane, cytoplasm and nucleus. The cytoplasm and nucleus are enclosed within the cell membrane, also called the plasma membrane. The membrane separates cells from one another and also the cell from the surrounding medium. The plasma movement of substances or materials both inward and outward. In order to observe the basic components of the cell, take an onion bulb. Remove the dry pink coverings (peels). You can easily separate these from the fleshy white layers of the bulb with the help of forceps or even with your hand. You can also break the onion bulb and separate out thin layers. Place a small piece of the thin onion peel in a drop of water on a glass slide. The thin layer can be cut into smaller pieces with the help of a blade or forceps. Add a drop of methylene blue solution to the layer and place a cover slip on it. While placing the cover slip ensure that there are no air bubbles under the cover slip. Observe the slide under the microscope. The boundary of the onion cell is the cell membrane covered by another thick covering called the cell wall. The central dense round body in the centre is called the nucleus. The jelly-like substance membrane is called cytoplasm. You have learnt earlier that the cell membrane gives shape to the cell. 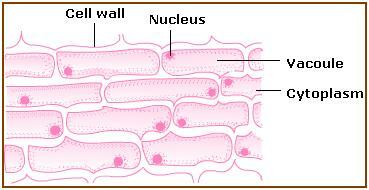 In addition to the cell membrane, there is an outer thick layer in cells of plants called cell wall. This additional layer surrounding the cell membrane is required by the plants for protection. Plant cells need protection against variations in temperature, high wind speed, atmospheric moisture, etc. They are exposed to these variations because they cannot move. Cells can be observed in the leaf peel of Tradescantia, Elodea or Rhoeo. You can prepare a slide as in the case of onion. Take a clean tooth pick or a matchstick with the tip broken. Scrape inside of your cheek without hurting it. Place it in a drop of water on a glass slide. Add a drop of iodine and place a cover slip over it. Alternatively, add 1-2 drops of methylene blue solution. Observe it under the microscope. You may notice several cells in the scraped material. You can identify the cell membrane, the cytoplasm and nucleus. A cell wall is absent in animal cells. It is the jelly-like substance present between the cell membrane and the nucleus. Various other components, or organelles, of cells are present in the cytoplasm. These are mitochondria, Golgi bodies, ribosomes, etc. You will learn about them in later classes. It is an important component of the living cell. It is generally spherical and located in the centre of the cell. It can be stained and seen easily with the help of a microscope. Nucleus is separated from the cytoplasm by a membrane called the nuclear membrane. This membrane is also porous and allows the movement of materials between the cytoplasm and the inside of the nucleus. With a microscope of higher magnification, we can see a smaller spherical body in the nucleus. It is called the nucleolus. In addition, nucleus contains thread-like structures called chromosomes. These carry genes and help in inheritance or transfer of characters from the parents to the offspring. The chromosomes can be seen only when the cell divides. Gene is a unit of inheritance in living organisms. It controls the transfer of a hereditary characteristic from parents to offspring. This means that your parents pass some of their characteristics on to you. If your father has brown eyes, you may also have brown eyes. If your mother has curly hair, you might also end up having curly hair. However, the different combination of genes from parents resultsin different characteristics. Nucleus, in addition to its role in inheritance, acts as control centre of the activities of the cell. The entire content of a living cell is known as protoplasm. It includes the cytoplasm and the nucleus. Protoplasm is called the living substance of the cell. Under the microscope, blank-looking structures in the cytoplasm are called vacuole. It could be single and big as in an onion cell. Cheek cells have smaller vacuoles. Large vacuoles are common in plant cells. Vacuoles in animal cells are much smaller. There are several small coloured bodies in the cytoplasm of the cells of Tradescantia leaf. They are scattered in the cytoplasm of the leaf cells. These are called plastids. They are of different colours. Some of them contain green pigment called chlorophyll. Green coloured plastids are called chloroplasts. They provide green colour to the leaves. You may recall that chlorophyll in the chloroplasts of leaves is essential for photosynthesis. You should be able to compare plant and animal cells. Observe the plant and animal cell carefully. Let us tabulate the similarities and disinguishing features of plant and animal cells. Only a few features are mentioned. You may add more. Some organisms are single-celled, while others	contain large number of cells. The cell has three main parts, (i) the cell membrane, (ii) cytoplasm which contains smaller components called organelles, and (iii)	the nucleus. Cells without well organised nucleus, i.e. lacking nuclear membrane, are called prokaryotic cells. Plant cells differ from animal cells in having	an additional layer around the cell membrane termed cell wall.